This thread is privately moderated by scousethief, who may elect to delete unwanted replies. 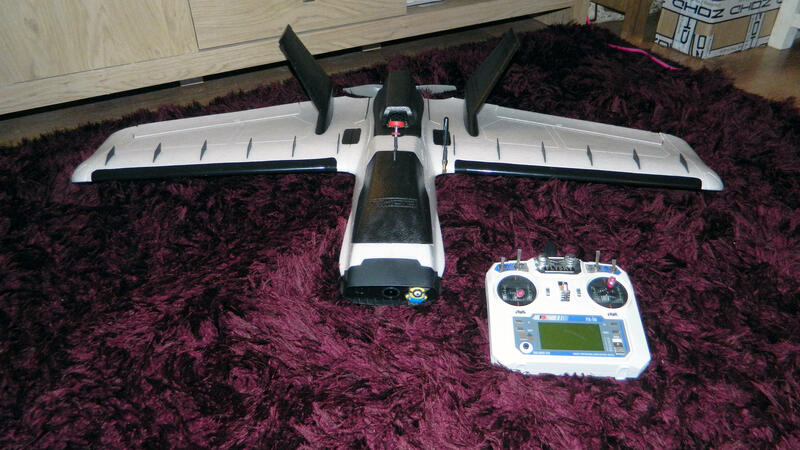 The Dart XL Extreme is the latest Flying wing from noted manufacturer Zohd/Sonicmodell. Following hot on the heels of the Extremely popular forward swept Dart Zohd have taken everything that they learned listening to the community and combined that with their own creative vision to create the Dart XL . Slightly bigger than its brother the Dart XL measures in at a tidy 1 metre and boasts some interesting features that on a "stock" model are very rarely seen. The XL "out of the box" has some funky little Vortex Generators, on the XL these are little plastic inserts that you can glue into the leading edge of the wing and their use should aid slower flight and help prevent early tip-stalls a trait i am far too familiar with The winglet or tip on the XL also points down rather than the more typical "up" and there is a ton of information with regard to which is best that you can toddle off and blow your mind with but it is suffice to say that if nothing else it "looks bloody awesome". On arrival the box was completely intact with zero damage and you can tell by just the quality of the protective box that Zohd mean business here. The whole aesthetic begins with the packaging and Zohd know that first impressions are extremely important so your first interaction with the product is the feel of the box (its why Apple take some much care on packaging choice ) . As hobbyists packaging is something that we are familiar with and in the back of our minds we start forming opinions from the box, we judge from the start that a flimsy cheap box denotes a cheap product, there can be no misconception here, the packaging is solid and of high quality . The inner packing is of equal quality and helps protect the molded BEPP parts within. 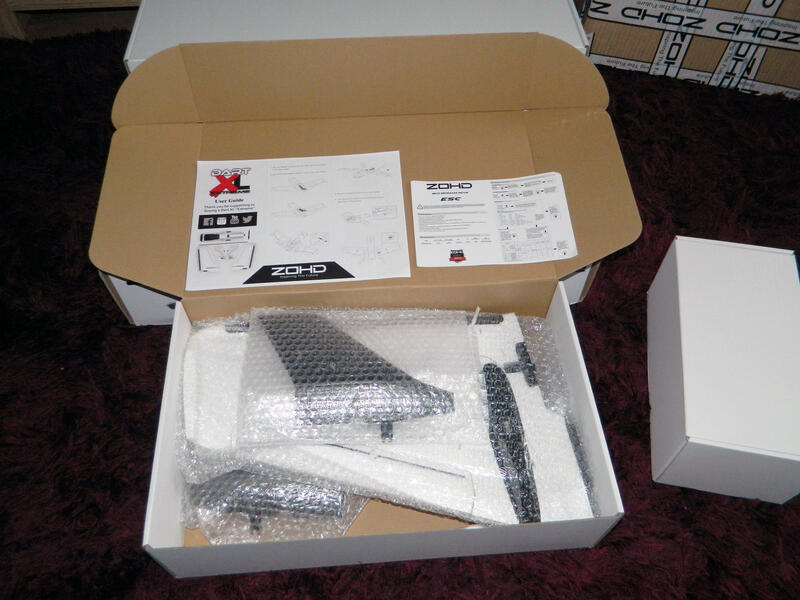 There are 3 inner boxes , the longer box contains the Dart XL main body and spar, the wider box contains the main wing panels and vertical stabilizers and the smaller box contains the accessories. The smaller of the boxes is a little "overkill" but i presume that there will be complete kits available at some point containing the other electrical accessories or a transmitter and so those extra components would take up the space of the smaller box. All of the components are wrapped in bubble wrap for extra protection, all hard pieces like the spar or accessories are bagged to keep them together. Main vertical stabilizer, there are some nice little detailed panels on the rudder and i think that if you were a little creative you could infact install some servos and make a functioning rudder. Rudder locking clip , this is a simple twist action clip and it seats the vertical stabilizer nice and tight. Main wing bottom showing servo placement , wire routing, landing skid, accessory connector, leading edge plastic guard and elevon with connectors. Close up of the servo-elevon control method. The small divot it to allow a screwdriver to get to the servo arm. Servo connector is buried into the wing panel, a second set of pins is available for extra accessories. The front "hole" is for the main spar and the rear is a threaded brass insert for the main wing bolt. 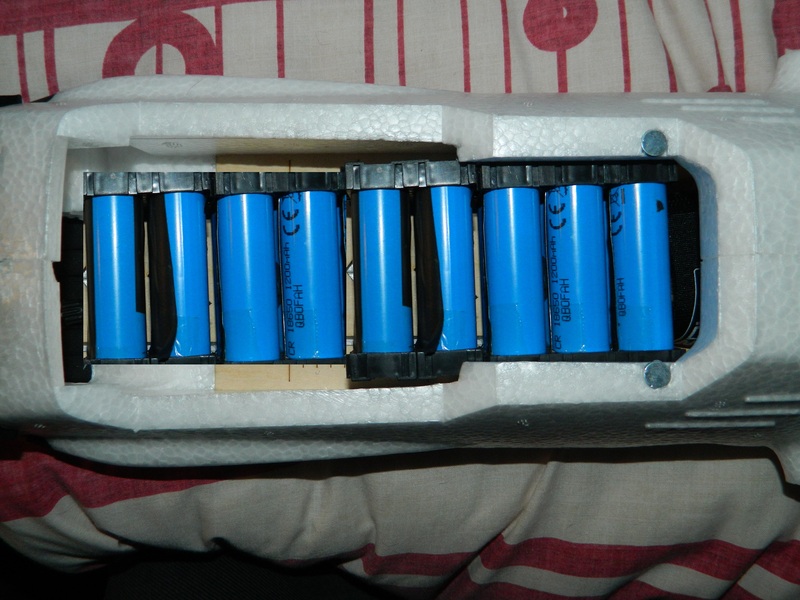 The rear of the wing as a plastic cover which siys in the wooden receptor at the rear of the fuse helping keep the wing solid and in place. Each wing has a rear landing skid which will help keep the foam away from hard surfaces. The centre section hos a hle cut through and is were the rudder locking tabs fit through. The main fuselage is hollow and has 2 removable canopies. The front canopy removes to gain access to the front storage area whilst the rear gives access to the esc and motor mount. All installed wiring is easily accessible and the extension wires for the servos and accessories can be easily routed creating a large inner cavity for air cooling. Rear bay with esc and motor mounts. The foam in this area is quite dense and strong but the extra plywood supports just add to that strength creating a roomy but solid electronics bay. The rear also holds the plywood outer for the plastic wing locator. Front battery bay and camera mount. The available area for batteries here is ENORMOUS !! i can easily fit 18 x 18650 batts in there and there is still room for one or two more and that doesnt include any of the space behind the canopy. The inside of the rear upper canopy just to show that the rear is vented. These are the retaining bolts for the wing connector. Velcro take and flight controller mounts. Nice sticker and the plastic replacement parts for the camera holes in the nose. Last edited by scousethief; Dec 10, 2018 at 06:37 AM. A lot of the details and photos! Great plane! What Flight Controller are you going to use? It looks a little like a Drak, to me at least - but a refined one. I really like how the wings and servos are connected to the fuse. It's for sure has similarities with Drak, but still this is bigger brother of Dart, so more inspired by, but much more better made! And well thought about details. Looks to be a well thought out design. Following with interest. 1. I'd of liked a more low profile aft deck hatch. Smooth airflow to the prop will result in a quieter plane. That tall hatch will likely cause a fair amount of turbulent air to the prop. 2. I'd prefer the pushrods to be on the top of the wing vs bottom. The bottom mounts are more prone to hitting things on landing and stripping servos. 3. I like the equipment bays at the ends of the wings. Great for VTx and Rx antenna separation. 4. I like the easy wing and vertical fin mounting/removal setup. Nicely done. Last edited by Vantasstic; Nov 13, 2018 at 11:05 AM. Some pics are missing one [ before the /img] part.